Today I had a personal tour of Lauriston Castle, which over looks the Firth of Forth in the North East of Edinburgh. I was only there for a quick look around, scoping the beautiful grounds and luxurious interiors of the castle for some sketching next week. I have visited the grounds in the past, there is a beautiful Oriental Garden and the views of the Forth to Fife are amazing. Especially now when there are daffodills are out all around. But I had never until now and can’t wait to return next week to sketch more. Each of the grand rooms are packed with trinkets, portraits and beautifully crafted furnature, most of which are hundreds of years old. The sketch above is from one end of the library, in a well lit corner of the room lies a writing desk and sculted chair, surrounded by books and ceiling to floor windows. Check back next week when I will have more to see after my second visit. Christine Roberts liked this on Facebook. Edie Marie Wagner liked this on Facebook. Meg Beveridge liked this on Facebook. Jade Kirkham liked this on Facebook. Sparky Forsyth liked this on Facebook. Lynne McNicoll liked this on Facebook. Caesarea Macpherson liked this on Facebook. Ed White liked this on Facebook. Julie McCabe Greig liked this on Facebook. Billy Hood liked this on Facebook. Marcy Daniels liked this on Facebook. Julie Fojtik Davenport liked this on Facebook. 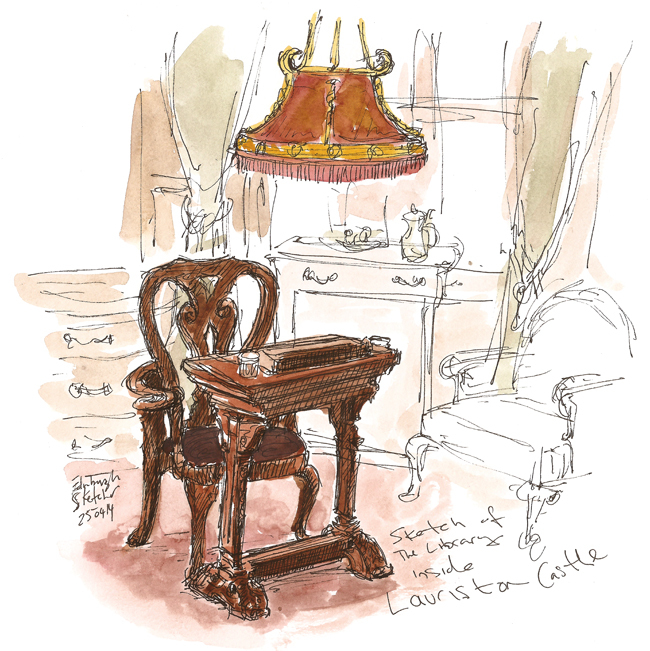 Lauriston Castle liked this on Facebook. Graeme Ross liked this on Facebook. Alistair Cassidy liked this on Facebook. @edinsketcher lucky you. Lovely sketch.